This entry was posted on October 10, 2018 at 1:44 pm and is filed under Inequality, International, Politics. You can follow any responses to this entry through the RSS 2.0 feed. You can leave a response, or trackback from your own site. I actually think that, on some level, Democrats do care about the material interests of workers. They just care even more about protecting the legitimacy of their own class (perhaps even more than protecting its material interests, which they perceive to be under less of a direct threat) and they cannot understand why the working class does not share this concern, let alone share the moral code that elite Democrats use to articulate their legitmacy. If there’s one thing I’ve learned in life, it’s that right-wing efforts to hold publicly-funded organizations “accountable” do NOT result in fewer jobs for educated people. They might result in slightly fewer jobs for people with an MA in Communications and slightly more jobs for people with an MBA, but even that phenomenon is less common than you might think. By and large, what happens is that they change the nature of the work (and sometimes the retirement benefits package) but not the amount of work. Assessment reports don’t write themselves! There’s a compromise between the plutocrats (often self-made men whose outlooks still bear the marks of their small business days) and the academics and bureaucrats, and that compromise is corporate: Still large and unwieldy and report-driven (just as the academics and bureaucrats like it) but with the original task of the organization replaced with bullet points, lists of Strategic Objectives, Outcomes Assessment, Metrics, etc. It satisfies the plutocrats’ desire to see the academics and bureaucrats suffer (they don’t get to do what they originally wanted to do), but it doesn’t mean fewer jobs for people with upper-middle-class socialization, strong written communication skills, and a proclivity for dense jargon. When I read Thomas PIketty’s Capital in the 21st Century, I saw that income inequality in the USA, the UK and France followed the same trend—a rise in the early 20th century, then a fall during the 30 years following World War II, and then a rise again. I realized that if the same thing was going on in different countries at the same time, there must be a common cause broader than the specific decisions made by Ronald Reagan, Bill Clinton, etc. 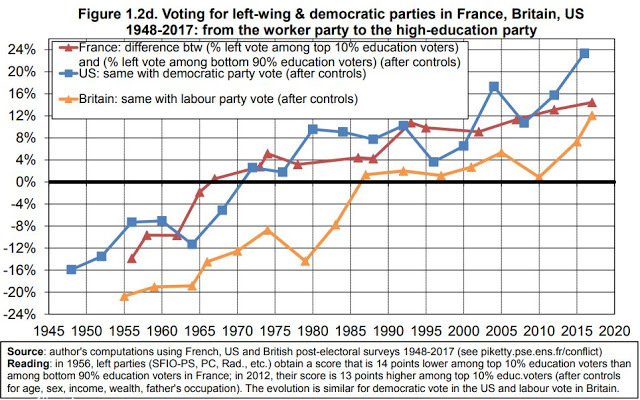 The current chart and essay tell me that the changes described by Thomas Frank in Listen, Liberal, are not unique to the USA and the Democratic Party, but must have some meta cause that is common to the USA, the UK and France. Now a left party (and, for that matter, a principled conservative party) needs its intellectuals. It is a good thing, not a bad thing, for a party to attract the support of well-educated professional people. The bad thing is when a left party is losing the support of the less-well educated majority, whose interests it supposedly represents. My guess is that the left parties (so-called) started to get relatively more support among the highly-educated class than among the less-educated 90 percent majority when leaders and intellectuals of those parties started to embrace economic globalization and neoliberalism. But there could be other reasons—questions of status and respect, for example, as you say.